Gray Megalodon Tooth 4 inches long. 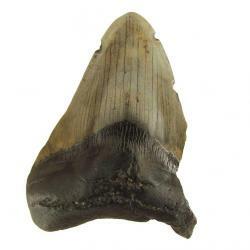 This Gray Megalodon Tooth measures 4.25 inches long. It was found in South Carolina. The enamel is in good shape. The serrations are worn off on both sides of the blade. Check the price. this is an impressive fossil for the money.